Patients with venous thromboembolism (VTE) carry a high risk of recurrence. Accordingly, a 16-year Danish prospective cohort study of nearly 74,000 patients with incident VTE concluded that the risk of recurrence is substantial. Furthermore, the scientists found that the recurrence risk is similar for patients with cancer and patients with unprovoked VTE, reports The American Journal of Medicine. VTE, comprising deep vein thrombosis and pulmonary embolism, is the third most common cardiovascular disease after myocardial infarction and stroke. Historical trials have reported a cumulative recurrence risk of nearly 40 percent after 10 years with associated high mortality. Recurrent VTE is largely preventable if patients receive extended duration anticoagulation therapy, but the protective effect must be carefully weighed against the risk of anticoagulant-related bleeding. "Optimal duration of anticoagulation is a pivotal and an ongoing scientific and clinical concern," explained lead investigator Ida Ehlers Albertsen, MD, of the Department of Cardiology, Aalborg University Hospital, and Aalborg Thrombosis Research Unit, Aalborg University, Aalborg, Denmark. "The emergence of the non-vitamin K antagonist oral anticoagulants has changed the landscape for prevention of thrombosis, and contemporary risk stratification approaches may need to be adjusted according to these effective and safer agents." The study investigated the risk of recurrence after incident VTE stratified according to provoked (i.e., following surgery or trauma), unprovoked (without well-known provoking risk factors), and cancer-related VTE in a group of close to 74,000 routine care Danish in- and outpatients. Researchers linked nationwide Danish health registries to identify all patients with incident VTE from January 2000 through December 2015. The study revealed a ten-year cumulative incidence of more than 15 percent for all groups, indicating a substantial risk of recurrence for all patients with VTE, even in a contemporary clinical setting. 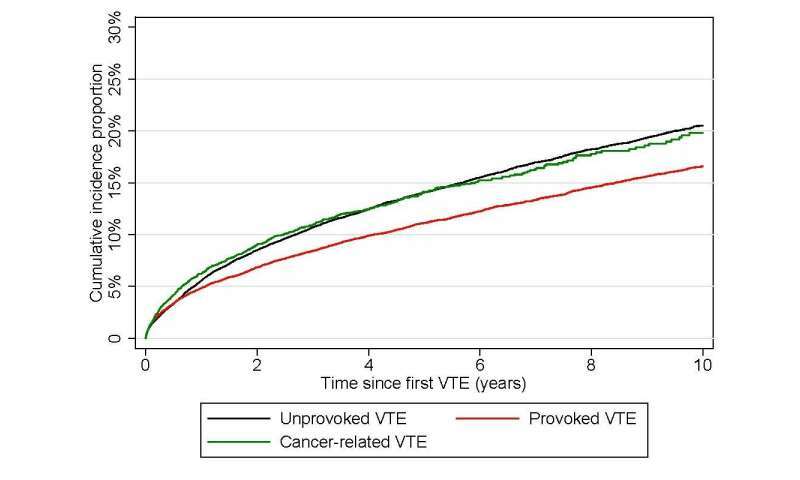 At 10-year follow-up, patients with unprovoked VTE (without cancer or any provoking factor) and cancer patients had the highest risk of recurrence compared with patients with provoked VTE. "Our concept of VTE is undergoing a major transition as we increasingly consider it as a chronic illness," commented co-investigator Professor Samuel Zachary Goldhaber, MD, of the Division of Cardiovascular Medicine, Brigham and Women's Hospital, Harvard Medical School, Boston, MA, USA. "Ideally, stratification based upon well-defined risk factors should consistently identify patients needing continued treatment and, conversely, patients who can be safely managed with shorter time-limited treatment." "Given the high risk of recurrence among all the types of incident VTE, it is worth discussing if the current recommended treatment duration after VTE according to clinical guidelines is optimal," noted Dr. Albertsen. "To optimize duration of anticoagulation, we may need to rethink the arbitrary categorization of provoked/unprovoked when risk stratifying patients with incident VTE and aim for more nuanced risk stratification."